A new type of light-emitting diode has been developed at TU Wien. Light is produced from the radiative decay of exciton complexes in layers of just a few atoms thickness. When particles bond in free space, they normally create atoms or molecules. However, much more exotic bonding states can be produced inside solid objects. Researchers at TU Wien have now managed to utilise this: so-called “multi-particle exciton complexes” have been produced by applying electrical pulses to extremely thin layers of material made from tungsten and selenium or sulphur. These exciton clusters are bonding states made up of electrons and “holes” in the material and can be converted into light. The result is an innovative form of light-emitting diode in which the wavelength of the desired light can be controlled with high precision. These findings have now been published in the journal “Nature Communications”. In a semiconductor material, electrical charge can be transported in two different ways. On the one hand, electrons can move straight through the material from atom to atom in which case they take negative charge with them. On the other hand, if an electron is missing somewhere in the semiconductor that point will be positively charged and referred to as a “hole”. If an electron moves up from a neighbouring atom and fills the hole, it in turn leaves a hole in its previous position. That way, holes can move through the material in a similar manner to electrons but in the opposite direction. Even more complex bonding states are possible: so-called trions, biexcitons or quintons which involve three, four or five bonding partners. “For example, the biexciton is the exciton equivalent of the hydrogen molecule H2”, explains Thomas Mueller. In most solids, such bonding states are only possible at extremely low temperatures. However the situation is different with so-called “two-dimensional materials”, which consist only of atom-thin layers. 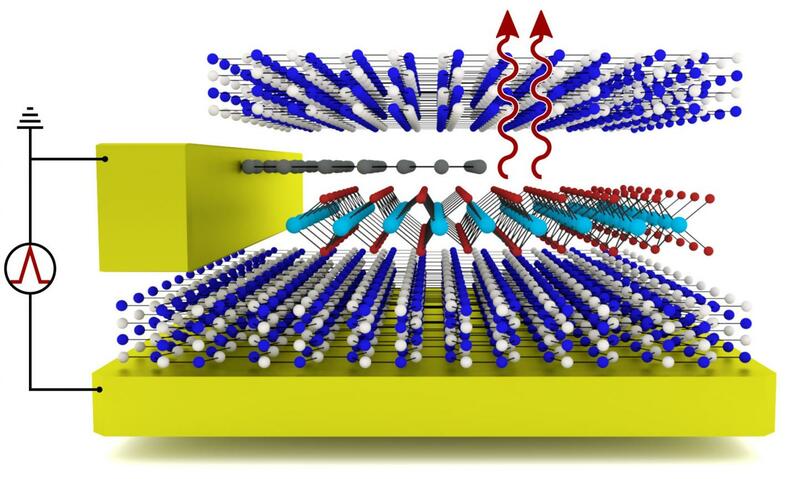 The team at TU Wien, whose members also included Matthias Paur and Aday Molina-Mendoza, has created a cleverly designed sandwich structure in which a thin layer of tungsten diselenide or tungsten disulphide is locked in between two boron nitride layers. An electrical charge can be applied to this ultra-thin layer system with the help of graphene electrodes. “The excitons have a much higher bonding energy in two-dimensional layered systems than in conventional solids and are therefore considerably more stable. Simple bonding states consisting of electrons and holes can be demonstrated even at room temperature. Large, exciton complexes can be detected at low temperatures”, reports Thomas Mueller. Different excitons complexes can be produced depending on how the system is supplied with electrical energy using short voltage pulses. When these complexes decay, they release energy in the form of light which is how the newly developed layer system works as a light-emitting diode.